The play "Natsu Matsuri Naniwa Kagami" was originally written for the puppet theater (Bunraku) and staged for the first time in the 7th lunar month of 1745 in Ôsaka at the Takemotoza. It was so successful that it was almost immediately adapted for Kabuki and staged for the first time in the 8th lunar month of 1745 in Kyôto at Miyako Mandayû's theater. 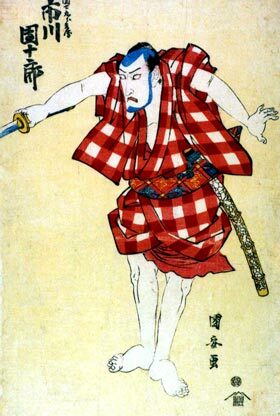 It was produced by the zamoto Nakamura Kiyosaburô I and starred Fujioka Daikichi and Sakakiyama Danshirô I in the roles of Danshichi Kurobê and Tsuribune Sabu. It was a long run and the performance was extended up to October. According to the chronicles, the play was simultaneously staged in another Kyôto theater in the 8th lunar month of 1745, at the Minamigawa no Shibai, produced by Nakamura Kumetarô I. A few months later, this Ôsaka play was finally staged in Ôsaka. The three main Kabuki venues decided to produce it almost simultaneously, starting a fierce competition for the best performance and line-up. It was first staged at the Ônishi no Shibai from the 5th of the 12th lunar month of 1745, produced by Arashi San'emon IV and starring Nakayama Shinkurô I in the role of Danshichi [casting]. Then it was staged at the Naka no Shibai from the 10th of the 12th lunar month of 1745, produced by Ichiyama Sukegorô I and starring Arashi Shichigorô I in the role of Danshichi [casting]. It was finally staged at the Kado no Shibai from the 15th of the 12th lunar month of 1745, produced by Arashi Sanjûrô II and starring him in the role of Danshichi [casting]. "Natsu Matsuri Naniwa Kagami" was staged for the first time in Edo in the 5th lunar month of 1747, at the Moritaza (casting unknown). "Sumiyoshi Torii Mae" (lit., in front of the Sumiyoshi Shrine torii) is the third act of the 9-act drama "Natsu Matsuri Naniwa Kagami". It is usually staged along with "Sabu Uchi" and "Nagamachi Ura". Generally fish-sellers in the Edo era (1603~1868) were rather hot-tempered and quarrelsome. Danshichi was one of them. 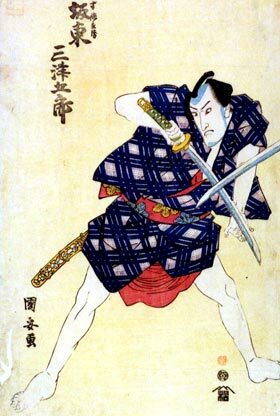 One day, he got into a fight with a servant of the samurai Ôtori Sagaemon. As a consequence, the two men were arrested and thrown into prison. While they were serving time, the servant died from a wound he got in the fight. On the other hand, Danshichi was released half-way through his sentence thanks to the intervention of the Tamashima family. Tamashima had been the lord of the house where Danshichi's wife Okaji worked. On the day of Danshichi's release, Okaji, their son, and Tsuribune no Sabu, go to the gate of Sumiyoshi Shrine, where Danshichi is scheduled to be released. Since they arrive a little early, Okaji goes into the shrine with the son to say a prayer of thanksgiving for her husband's early release. Meanwhile, a palanquin stops at the gate. In the palanquin there is a young effeminate man. The bearers, Gon and Hachi, have an evil plan. They start to blackmail the young man, and a dispute erupts. The weak young man is at a loss as to what to do. Meanwhile, Sabu, who is waiting by the gate for Okaji and her son, notices the young man's difficult situation . He cannot bear to just stand by and witness the injustice. So, Sabu saves him by kicking the two bearers out of the way. While the young man is thanking Sabu for his help, Sabu learns that he is Isonojô-the son of the Tamashima family. He advises Isonojô to go and wait for him at a certain "tang shop," a shop that sells seaweed. Sabu says that he will be of further help to Isonojô when he meets him later. Then Sabu asks Sankichi, a hairdresser, if he can wait a little while in his shop for Danshichi. Before long, Danshichi appears in a prison uniform, looking in rather bad-shape. The police release him and leave. He murmurs to himself, "I must thank Tamashima at any cost." then continues saying, "I shall guard his son Isonojô, in requital of his favor to me." At this point, Sabu arrives and they rejoice together over their reunion. Sabu tells Danshichi of the many things that happened in the outside world during his absence and includes Isonojô's run-in a little earlier. Danshichi enters the hairdresser's shop to have his shaggy growth of hair cut, while Sabu proceeds ahead to the shop where Isonojô is waiting for him. After a while, Kotoura appears at the gate of the shrine, looking for Isonojô. She is stopped, however, by Ôtori Sagaemon, who has a one-sided love towards her. Danshichi comes out of the hairdresser's shop, looking neat and tidy just in time to rescue her and tell her where Isonojô is. Then she rushes off to meet him. Danshichi also decides to go see Isonojô. As he is about to leave, however, Gon, Hachi, and Issun Tokubê appear, confront him, and start giving him a hard time for interfering with Ôtori's attempt to get Kotoura. A fight breaks out. At this point, Okaji emerges from the shrine and sees what is happening. While she is attempting to make peace, she and Tokubê recognize each other in astonishment. It was Okaji that had earlier rescued Tokubê from becoming a beggar. Tokubê bears a great debt to her, so when he realizes that Danshichi is her husband, he immediately apologizes to Okaji and ends the quarrel. Then when he hears that Danshichi and Okaji are in turn indebted to Isonojô's father, he confesses that Isonojô's family are close relatives of his previous lord. Such being the case, Tokubê offers his aid to Isonojô. Finally Danshichi and Tokubê exchange sleeves with each other and make a deep and solemn pledge to be sworn brothers. The mon of the actor performing the role of Danshichi is traditionally displayed on the curtain of the hairdresser shop.